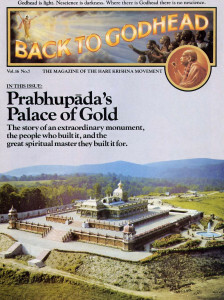 The following conversation between His Divine Grace A.C. Bhaktivedanta Swami Prabhupada, Srila Kirtanananda Swami Bhaktipada, and Kulasekhara dasa took place in New Vrindaban in June of 1976. Srila Prabhupada: The Western civilization is a nasty civilization, artificially increasing the necessities of life. For example, take the electric light. The electric light requires a generator, and to run the generator you need petroleum. As soon as the petroleum supply is stopped, everything will stop. But to get petroleum you have to painstakingly search it out and bore deep into the earth, sometimes in the middle of the ocean. This is ugra-karma, horrible work. The same purpose can be served by growing some castor seeds, pressing out the oil, and putting the oil into a pot with a wick. We admit that you have improved the lighting system with electricity, but to improve from the castor-oil lamp to the electric lamp you have to work very hard. You have to go to the middle of the ocean and drill and then draw out the petroleum, and in this way the real goal of your life is missed. You are in a precarious position, constantly dying and taking birth in various species of life. How to get free of this cycle of birth and death—this is your problem. And this problem is meant to be solved in the human life. You have advanced intelligence for self-realization, but instead of using your advanced intelligence for self-realization, you are utilizing it to improve from the castor-oil lamp to the electric lamp. That’s all. Kulasekhara dasa: People would say that your suggestion is impractical. Besides, electricity does many other things besides produce light. Most of our modern comforts depend more or less on electricity. Srila Prabhupada: In this life you may be living very comfortably, but in the next life you might become a dog. Srila Kirtanananda Swami: People don’t believe that. Srila Prabhupada: Whether they believe it or not, it is a fact. For example, a boy does not know that he is going to grow into a young man, but his mother and father know. If the boy says, “No, I’m not going to become a young man,” that is childish, The father and mother know that the boy will grow into a young man and that they should educate him so he can be properly situated. This is the guardians’ duty. Similarly, when we talk of transmigration of the soul, a rascal may say, “I don’t believe in it,” but it is still a fact. A rascal, a mad-man, may say transmigration is not a fact, but the real fact is that he’ll have to accept another body according to the quality of his endeavor in this life. (karanam guna-sango ‘sya sad-asad-yoni-janmasu). Srila Prabhupada: You may enjoy, but by enjoying you forget your real goal in life. Is that intelligent? You have been given the human body to improve your next life. Suppose you become a dog in your next life. Is that success? You must know the science of Krsna consciousness. Then, instead of becoming a dog, you will become like God. Kulasekhara Dasa: Once, at John Lennon’s estate in London, you said that the tractor is the cause of so much of the trouble today. It took all the work from the young men and forced them to go to the city for work, and they became entangled in sense gratification. I’ve noticed that life in. the country is simpler, more peaceful. It’s easier to think of spiritual life. Srila Prabhupada: Yes. The country is less disturbing, less taxing on the brain. Just work a little for your food, and the rest of the time engage yourself in Krsna consciousness. This is ideal life. [Srila Prabhupada holds up a flower.] See the minute fibers in this flower. Can anyone manufacture this in a factory—such small fibers? And how brilliant the color is! If you study only one flower, you become God conscious. There is a machine that you call “nature,” and from this machine everything is coming. But who has built this machine? Kulasekhara Dasa: In London you said people don’t know that the flowers are painted by Krsna—with thought. Srila Prabhupada: Yes. Do you think that without an artist the flowers can come out so beautiful? This is foolish. What is nature? It is Krsna’s machine. Everything is being done by the machine of Krsna. So improve your mode of living at New Vrindaban. Live in an open place, produce your own food grains, produce your own milk, save time, chant Hare Krsna. Plain living, high thinking: ideal life. But if you increase the artificial necessities of your life—your so-called comforts—and forget your real work of Krsna consciousness, that is suicidal. We want to stop this suicidal policy. Of course, we don’t insist that people stop the modern advancement of technology. We just present the simple formula given by Sri Caitanya Mahaprabhu: Chant Hare Krsna. Even in your technological factory you can chant. What is the difficulty? You can go on pushing the buttons on your machine and simultaneously chant Hare Krsna, Hare Krsna, Krsna Krsna, Hare Hare/ Hare Rama, Hare Rama, Rama Rama, Hare Hare. Srila Kirtanananda Swami: And if people take up the chanting, gradually they will give up the technology? Srila Kirtanananda Swami: So you’re sowing the seeds of their destruction. 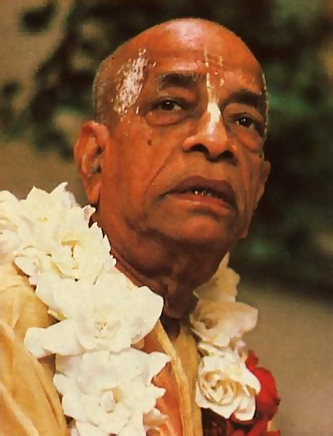 Srila Prabhupada: No, not destruction; rather construction. The repetition of birth and death, the constant change of bodies-this is destruction. But by our method, you live forever—tyaktva deham punar janma naiti: you don’t get another material body. But without Krsna consciousness, tatha dehantara-praptih: you have to accept another body, which means suffering. So, which is better? To accept material bodies, one after another, or to accept no more material bodies? If we finish our suffering with this body, that is intelligent, and if we create another body for further suffering, that is unintelligent. But unless you understand Krsna, you have to accept another body. There is no alternative.